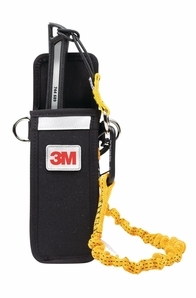 Constructed from a premium heavy duty ballistic denier fabric and high density webbing, the 3M� DBI-SALA� Extra-Deep Single Tool Holster is engineered to withstand punishing environments. An 8" x 3.5" pocket is capable of storing many larger hand tools. 1" D-rings on both sides of the holster are load-rated for 5 pounds each, allowing the user to decide how to best tether a tool. The holster is feature rich equipped with a Hi-Vis locator system, Quick-Mag tool staging system, and a drainage vent.